Organization owners can require organization members and outside collaborators to enable two-factor authentication for their personal accounts, making it harder for malicious actors to access an organization's repositories and settings. Built-in Authentication is performed against user accounts that are stored on the GitHub Enterprise appliance. Supported and managed on the GitHub Enterprise appliance. Organization administrators can require 2FA to be enabled for members of the organization. LDAP Allows integration with your company directory service for authentication. Supported and managed on the GitHub Enterprise appliance. Organization administrators can require 2FA to be enabled for members of the organization. SAML Authentication is performed on an external identity provider. Not supported or managed on the GitHub Enterprise appliance, but may be supported by the external authentication provider. Two-factor authentication enforcement on organizations is not available. CAS Single sign-on service is provided by an external server. Not supported or managed on the GitHub Enterprise appliance, but may be supported by the external authentication provider. Two-factor authentication enforcement on organizations is not available. Before you can require organization members and outside collaborators to use 2FA, you must enable two-factor authentication for your own personal account. When you require use of two-factor authentication for your organization, members and outside collaborators (including bot accounts) who do not use 2FA will be removed from the organization and lose access to its repositories. They will also lose access to their forks of the organization's private repositories. You can reinstate their access privileges and settings if they enable two-factor authentication for their personal account within three months of their removal from your organization. If an organization owner, member, or outside collaborator disables 2FA for their personal account after you've enabled required two-factor authentication, they will automatically be removed from the organization. If you're the sole owner of an organization that requires two-factor authentication, you won't be able to disable 2FA for your personal account without disabling required two-factor authentication for the organization. Before you require use of two-factor authentication, we recommend notifying organization members and outside collaborators and asking them to set up 2FA for their accounts. You can see if members and outside collaborators already use 2FA on your organization's People page. 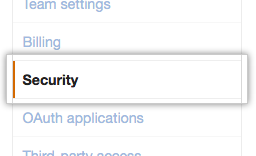 In the organization settings sidebar, click Security. Under "Authentication", select Require two-factor authentication for everyone in your organization, then click Save. If prompted, read the information about members and outside collaborators who will be removed from the organization. 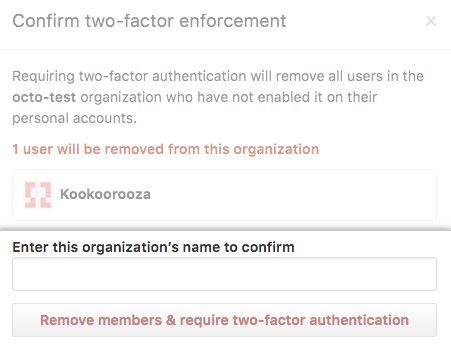 Type your organization's name to confirm the change, then click Remove members & require two-factor authentication. To view people who were automatically removed from your organization for non-compliance when you required two-factor authentication, you can search your organization's audit log for people removed from your organization. The audit log event will show if a person was removed for 2FA non-compliance. 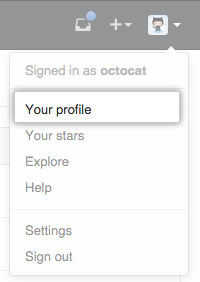 In the Settings sidebar, click Audit log. You can also view people who were removed from your organization by using a time frame in your search. If any members or outside collaborators are removed from the organization when you enable required use of two-factor authentication, they'll receive an email notifying them that they've been removed. They should then enable 2FA for their personal account, and contact an organization owner to request access to your organization. "Viewing whether users in your organization have 2FA enabled"
"Reinstating a former member of your organization"
"Reinstating a former outside collaborator's access to your organization"